World of Warcraft is a behemoth. It makes a ton of money every month, and even though it's ten years old, Blizzard just announced that game servers would finally be rolled out in Australia. That's a solid vote of confidence in the game's long-term viability. But the subscriber numbers have dwindled, to "only" about 7.4 million at last count, and of course free-to-play is all the rage these days. So naturally, investors want to know if Blizzard is thinking about making the transition. The short answer is, no. "I don't foresee any dramatic changes to our business model in World of Warcraft," Blizzard CEO Mike Morhaime said during an investor's call, transcribed by Seeking Alpha. "We do currently provide the first 20 levels of World of Warcraft completely free. So anybody is able to try those out." 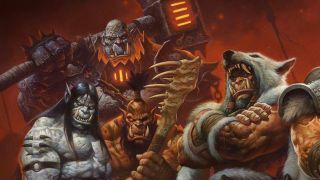 World of Warcraft generally sees a surge in subscriptions immediately following the release of an expansion, Morhaime explained, and that's held true with the upcoming Warlords of Draenor, which has helped push the subscriber count from 6.8 million to 7.4 million in advance of its November 13 launch. But this time around, Blizzard has also focused on making it easier for lapsed players to return to the game and quickly catch up on what's changed since they quit. "We're already seeing positive signs that it's working," Morhaime said. "We have updated the player models in Warlords of Draenor and have really freshened the game's look and feel. We've added the new Garrisons feature that allows players to create a home base in the world. And we're hoping that these improvements will help players feel more ownership and attachment to the game and will make it more fun for them to stick around following the expansion." Along with planning for the future, Blizzard is also preparing to give fans a look back at the game's ten-year history with the coming release of World of Warcraft: Looking for Group, a documentary featuring both players and creators that promises to take viewers "into corners of Blizzard and the WoW community you've never seen before." World of Warcraft: Looking for Group will premiere at 5 pm PST on November 8 on the Blizzcon World of Warcraft Tournament Live Stream.